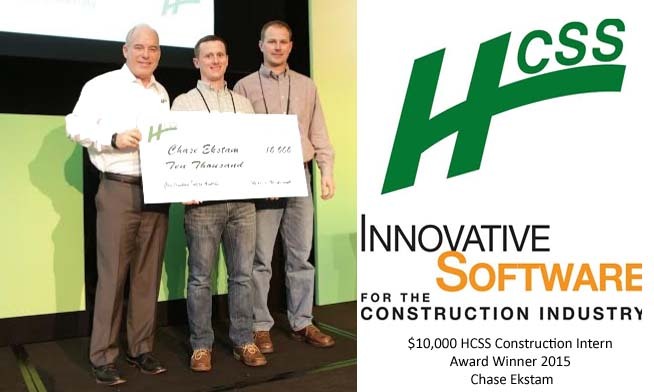 Construction software developer HCSS will be awarding a total of $50,000 in college scholarships to students in construction-related fields. The top winner will receive a $10,000 scholarship. 12 honorable mentions will be awarded a $2,000 scholarship. Submissions are now open for the 2016 Construction Intern Awards, and will be accepted until Sept. 16. Eligible internships include any internship in a construction-related field of at least two months in length that occurred during the 2015-2016 school year or Summer 2016. Participants must have been enrolled in a college, university, or trade school for the 2015-2016 school year. Two groups of finalists will be among the top 17 entries: eight entries chosen from popular vote and nine entries chosen by a selection committee. Those 17 combined finalists are guaranteed at least a $2,000 scholarship, and will be submitted to a voting panel comprised of seasoned industry experts, representing varied sectors of the construction industry. That panel will choose the top students; four will be named finalists who will each receive a $4,000 scholarship and one Intern of the Year will be awarded the Grand Prize $10,000 scholarship. The panel includes Pete Ruane, CEO of the American Road and Transportation Builders Association (ARTBA); Steve Sandherr, CEO of The Associated General Contractors of America (AGC); Carl Heinlein, Safety Consultant with ACIG; Rick Schwer, VP/Publisher of SGC Group; Stuart Binstock, CEO of the Construction Financial Management Association (CFMA); Michael Holland, President of the American Council for Construction Education (ACCE); Lori Brown, President of the Associated Schools of Construction (ASC); Bill Hillman, CEO of the National Utility Contractors Association (NUCA); Marcia Gruver Doyle, Editorial Director, Randall-Reilly; Stan Orr, President and CSO of the Association of Equipment Management Professionals (AEMP); Greg Sizemore, Vice President of HS&E and Workforce Development of the Association of Builders and Contractors; Steve McGough, HCSS President and COO; and, Chase Ekstam, 2015 Construction Intern Award winner.